Life can exist in Earth's most extreme environments: the darkest ocean depths, the coldest Arctic wastes, the saltiest seas, mile-deep rocks, even submarine volcanic vents. But seeing proof of life on Mars in last week's announcement of the discovery of organic molecules and seasonal methane emissions on the Red Planet is wishful thinking. Maybe there is life on Mars. We have not found any, nor can we say that organic chemistry cooked out of ancient Martian rocks or fresh methane in the planet's thin atmosphere are categorical evidence that life ever existed anywhere but Earth. "Life on Mars? Probably, yes," says Inga Loes ten Kate of Utrecht University, mainly because she finds it hard to believe that life only developed only once. But all the discoveries made on Mars so far can be explained by geology, she tells Haaretz. 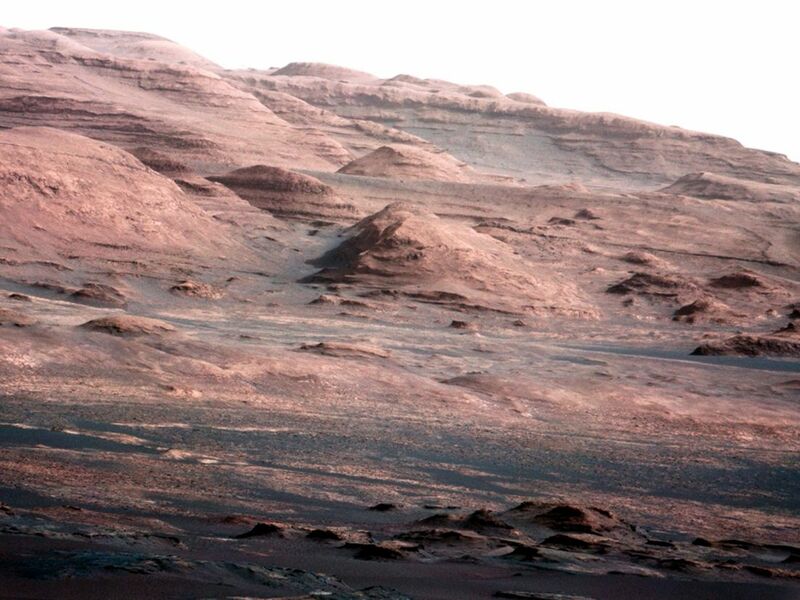 So far, the only signs of life to be found on Mars are the tracks of human-made rovers. Based on the approach of Occam's Razor (don't make assumptions you don't have to): "Geology is a more favorable process than life. Geology happens first; then under the right conditions, and we do not know what they are life can develop," says ten Kate. On Thursday "Organic molecules on Mars" by Jennifer Eigenbrode and colleagues was published in Science, and a second paper in the same journal, by Christopher Webster and colleagues, reported on methane spikes in the Martian atmosphere during summer. Ten Kate, an expert on the search for Martian life, emphasizes that, despite the promising research, caution is due. One of many caveats: We have no idea what extraterrestrial life might look like, whether it shares our chemistry, and so on. For all we know there are aliens made of dark matter living among us and we can't observe them (this is known as the "cosmic gorilla effect"). It all sounds very promising. But ten Kate emphasizes that caution is due. The term "organic" simply means that a certain molecule contains carbon. Methane for instance is just CH4 – one carbon atom, four hydrogen atoms - and it's considered an organic molecule, which can be a metabolic byproduct but can also have a purely chemical origin. Many organic molecules, including quite complex ones, can and are made by non-biological processes. The mere presence of methane means nothing. NASA's Curiosity rover found the organic compounds in mudstones at Gale crater. The rover heated the rock samples, analyzed the released molecules, and lo, there were organics. Actually, organics had been found on Mars before, at a different spot in the same crater. The compounds themselves cannot be dated but the sediment in which they were found, could be. Those rocks are about 3.2 to 3.8 billion years old, which could also be the date of the organics. Ten Kate notes however that the molecules could be from a completely different time, and seeped into these ancient rocks. From where? Who knows? Ten Kate speculates that the Martian organic compounds found in the rocks had changed over the billions of years, given their bombardment with solar radiation, geological processes, and other phenomena. "They're probably residuals of something else," she says. "To really say – this is life, we need additional proof," ten Kate sums up, especially given that organics produced abiotically (i.e. non-biologically) are not rare. In fact just last year scientists at The Scripps Research Institute in California proposed a chemical solution for how life began on violent early Earth, and it involved abiotically produced chemicals. For what it's worth, on Earth, for example, liquid water containing organic molecules can react with rocks, resulting in rocks with organic compounds. No reason to think it couldn't happen on Mars too. Life is believed to have begun on Earth about 3.9 to 4 billion years ago. Though there is no consensus about how it began, most scientists agree that water, or some liquid, is necessary. For life to have developed on Mars 3 billion or more years ago, the planet would have had to have standing water. 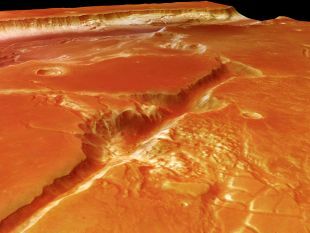 We have known for about five years that early Mars was warmer and had a thicker atmosphere than now, and at some point, it almost certainly had liquid water on at least part of its surface, including at Gale. The crater formed about 4 billion years ago, ten Kate says: its age and characteristics explain why the scientists chose to robotically explore and drill there. They wanted to know whether the conditions at Gale plus-minus 4 billion years ago were similar to the conditions on early Earth, when life developed. One snag is that we don't know what the conditions on early Earth were like when life developed. But that's life. Even today, there could be the odd puddle on Mars. "We know there is water vapor in the atmosphere," says ten Kate. The surface temperature can fluctuate between -90 degrees Celsius at night to as much as 20 degrees during the day, which is positively balmy. In that 100-degree fluctuation, there could be small windows in which atmospheric water freezes on the surface at night; as the sun rises, it goes through a liquid phase. 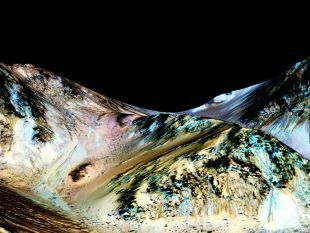 The atmospheric pressure on Mars is too weak to sustain the liquid phase, but water might bind to chlorates in the soil, resulting in brine, which is more resistant to evaporation. Now, we know life can exist in brine, like in the Dead Sea, which brims with halophilic tourists and bacteria (and some fungi). Anyway, mineralogy shows the water at Gale was relatively fresh, not particularly briny, and had been close to a neutral pH. Now for that methane. Previously shown in the upper atmosphere and now at the surface – there is definitely methane on Mars, and its concentration is seasonal, rising in summer and decreasing in winter. This was measured over three years. Most of the methane on Earth is from biological origin, but again, there's no reason to think that sauce for the goose is sauce for the Martian gander. Abiotic processes could explain the Martian methane, one hypothesis being that the gas is trapped in subsurface ice "cages." Come the summer they melt and gas does what gas does: it rises. But where did that caged methane come from? How long has it been there – billions of years? A few thousand? Again, we don't know. "The methane is most likely seeping out from the surface," ten Kate says. As for the organics, right now the most logical explanation is that they came from deep outer space. Comets and interplanetary dust contain organic material, and no, this isn't testimony to the panspermia theory that comets delivered life forms to multiple planets. This is testimony to the theory that comets delivered organic molecules. And maybe there is life on Mars, but if there is, or was, we haven’t found it yet.